This double duty pack strikes a sweet balance between a day tripper and all-out trek bag. 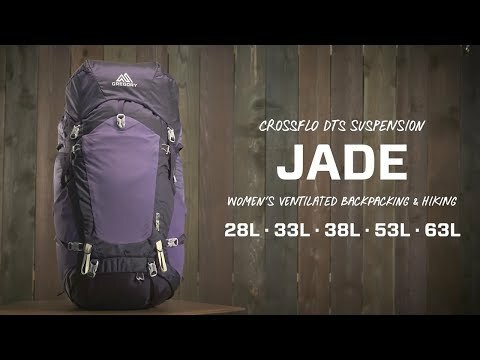 Its unique CrossFlo suspension supports big loads for overnight trips and long weekend ventures. The shoulder straps, back panel and waist belt are tailored to fit the female form, plus a vented trampoline back panel gives your skin lots of room to breathe. Nylon body with abraison-resistant base and water-resistant polyester lining. CrossFlo DTS suspension creates space between your back and the pack for airflow without sacrificing load management, adding weight or reducing volume in the storage compartment. Tensioned steel wire X frame arcs over open mesh backpanel. Harness yoke transfers weight via a dynamic yoke panel that's activated as weight increases to balance flex and stiffness in the frame. Space between pack and back improves venting in hot weather and improves the performance of waterproof breathable garments in wet weather. Ventilated die cut EVA foam padding on shoulder straps and hipbelt adds breathability and decreases weight. Lumbar foam increases load-bearing comfort. Internal HDPE frame sheet with anti-barrelling stay stabilizes the load and gives the pack structure. Shoulder straps, backpanel and waistbelt are designed to fit women. Sidekick 10L day pack has simple shoulder straps, drawstring top, zippered front pocket and daisy chains. Doubles as the main pack’s inner hydration sleeve.